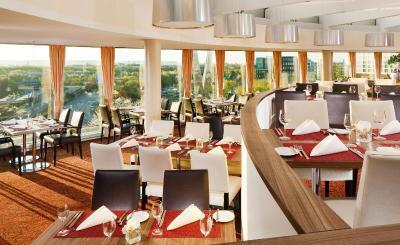 Lock in a great price for Sheraton Duesseldorf Airport Hotel – rated 8.5 by recent guests! Beautiful room with attentive staff an elevator ride from the parking garage and a short walk from the terminal and the Air France desk. The hotel was whisper silent. 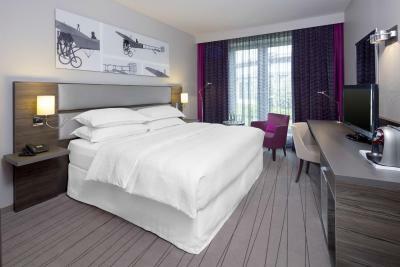 We always stay here when we have to catch an early morning flight from Duesseldorf airport. It is just a short walk through the parking garage to get to the terminal (and/or public transportation into Duesseldorf). 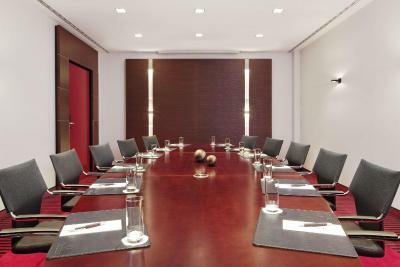 The staff is very professional and friendly, the rooms comfortable and quiet. Since we left very early we did not try the breakfast. The hotel is just next to the airport, which is very convenient for me to catch up the early flight. The bed is comfortable, and the breakfast has many options. Nesspresso machine in every room ! Quietest airport room ever ! The location is very good and convenient to downtown. Reception tried to get us room early as we arrived after a very long flight. We waited only 2 hrs. Very good location for travellers , and what I really liked was the absolute quietness despite of the location . 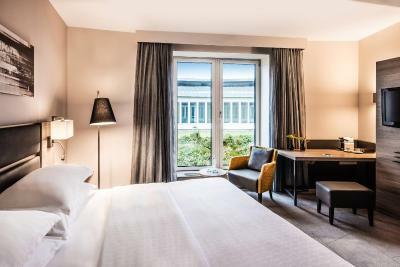 Sheraton Duesseldorf Airport Hotel This rating is a reflection of how the property compares to the industry standard when it comes to price, facilities and services available. It's based on a self-evaluation by the property. Use this rating to help choose your stay! 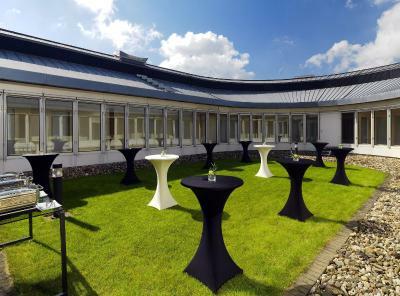 One of our top picks in Düsseldorf.This elegant hotel is located directly above Düsseldorf Airport's parking deck P3, and is just 1.9 mi from Messe Düsseldorf Convention Center. It offers free WiFi in the public working area, a restaurant, and a 24-hour fitness room. 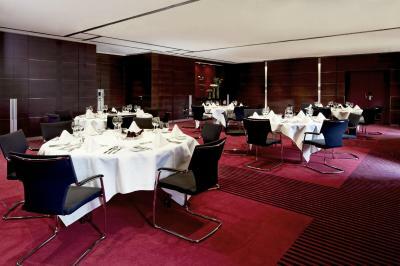 The Sheraton Düsseldorf Airport Hotel is designed in a penthouse style. 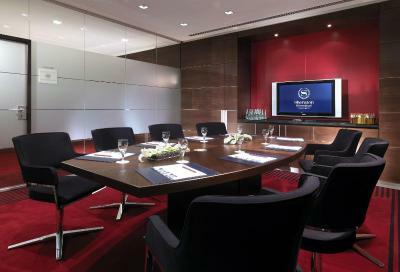 It has soundproofed rooms with a view of the Sheraton's green rooftop terrace. 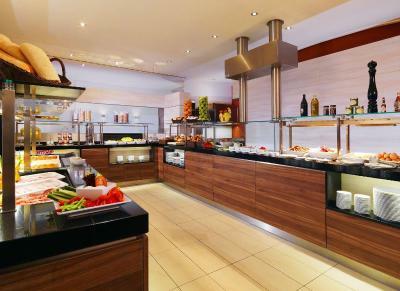 In addition to 24-hour room service, an early breakfast is available daily from 03.30 until 05:00 in the morning. 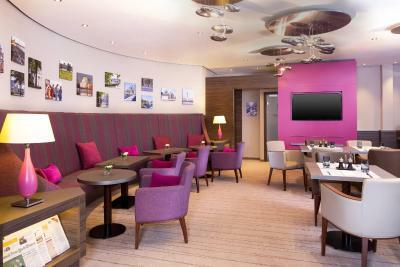 Guests can also relax in the Sheraton's panoramic Restaurant Otto and On Chocs Bar & Lounge. 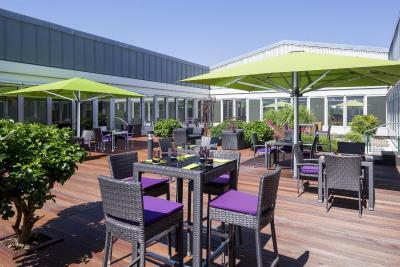 The Sheraton Düsseldorf Airport's business lounges provide free Wi-Fi and free use of computer terminals, guests can also enjoy a summer terrace. 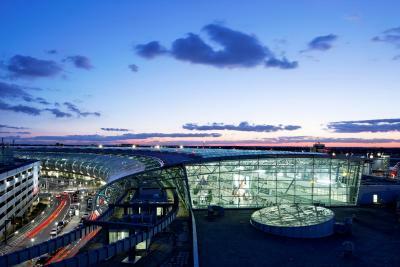 The Flughafen Fernbahnhof train station is just 0.6 miles away from the Sheraton Düsseldorf. Lohausen is a great choice for travelers interested in convenient public transportation, city trips and old-town exploration. 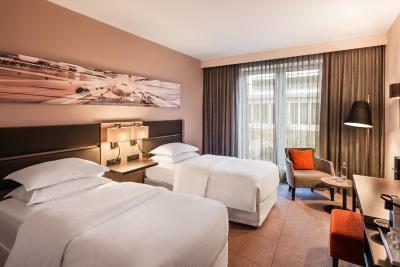 When would you like to stay at Sheraton Duesseldorf Airport Hotel? 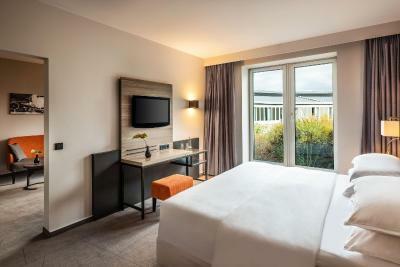 This twin room has a bathrobe, soundproofing and garden view. 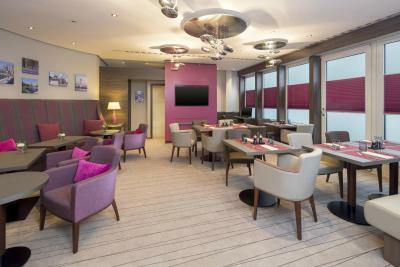 This suite has a mini-bar, electric kettle and executive lounge access. 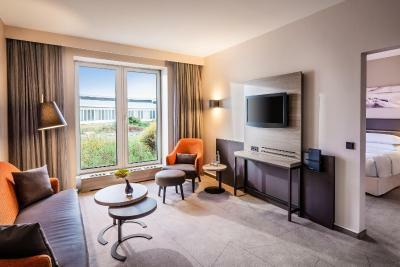 House Rules Sheraton Duesseldorf Airport Hotel takes special requests – add in the next step! 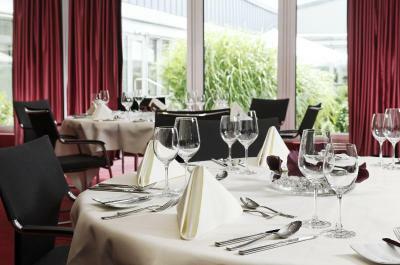 Sheraton Duesseldorf Airport Hotel accepts these cards and reserves the right to temporarily hold an amount prior to arrival. Too small rooms, too small bathrooms, no fridge and mini bar. Dirty moquette. Impossible to regulate the room temperature in mid seasons. It was cold inside the room. The price was eye watering, because of the airport and fairground location it was astronomical. Took us a while to find the drop off location in the car park. Great location for the airport and parking. 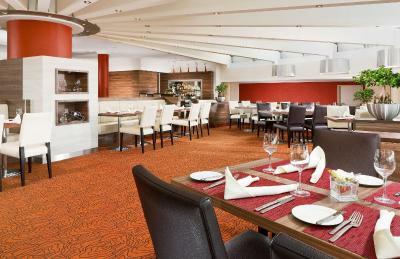 Breakfast was of a high quality and staff very helpful. Not a value for money hotel. Breakfast is not included in the (not low) price and the room had not even a mini bar. Because of the room is next to the bar, which was a very croudy place, it was a really noisy room. 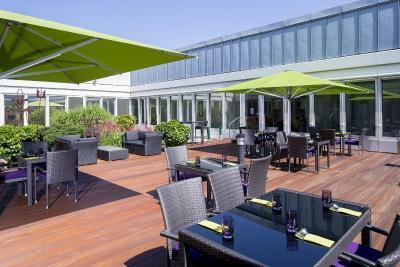 The best was that the hotel is located in the airport and has very easy access to the departures and arrivals. Help in the restaurant not as attentive as in other countries. A bit slow to clean the table, and a didn't check up to see if I needed anything else. Breakfast was spectacular. Eggs, meats, breads, fruits, cheeses, pastries all superior quality, with plenty of choices. Excellent location. Great and friendly staff and good hotel. Absence of mini bar, they first room they gave me was already occupied which I only discovered after walking a long way and entering the room, then they forgot to give me the wifi code associated with the second room, which was also a long walk away. Modern room with pretty much all that I needed.